Gordon MacKenzie of Manitoba-Northwestern Ontario Command points to the name of D.C. Bowes. I found the name I was looking for on the Menin Gate Memorial to the Missing in Ypres, Belgium, along the stairway where moments earlier school groups and regimental representatives had placed wreaths. The name, under the 44th Battalion of the Canadian Expeditionary Force, was simply D.C. Bowes. Clifford Bowes was killed at Passchendaele in 1917. Though he was buried at the time, by war’s end the grave could not be found and he is commemorated here— one of 54,616 Commonwealth dead who fell in Belgium and have no known grave. 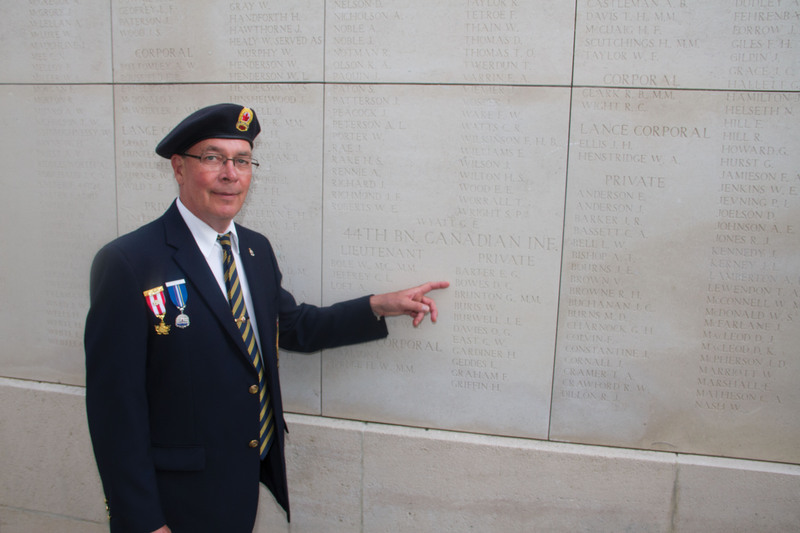 It was a discovery for me, similar to ones made by 10 of the pilgrims on The Royal Canadian Legion’s 2017 Pilgrimage of Remembrance in the various military cemeteries visited throughout France and Belgium. 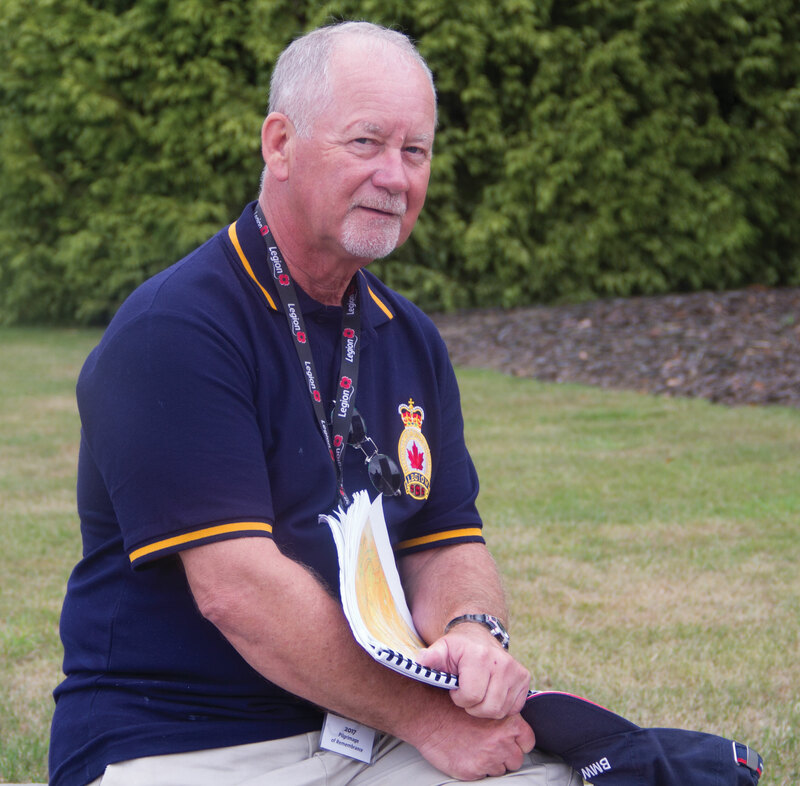 The pilgrimage is a two-week coach tour organized by the Dominion Command Poppy and Remembrance Committee to give participants a chance to walk the ground covered by Canadians in two world wars. The July 8-22 pilgrimage was headed by Dominion Vice-President Angus Stanfield. Dominion Secretary Brad White, assisted by his wife Therese Canuel, acted as tour co-ordinator while John Goheen, who has guided the pilgrimages for more than 20 years, was the tour’s historical expert. Ten pilgrims, one from each command, were chosen for the trip and would participate in the formal ceremonies planned along the way. 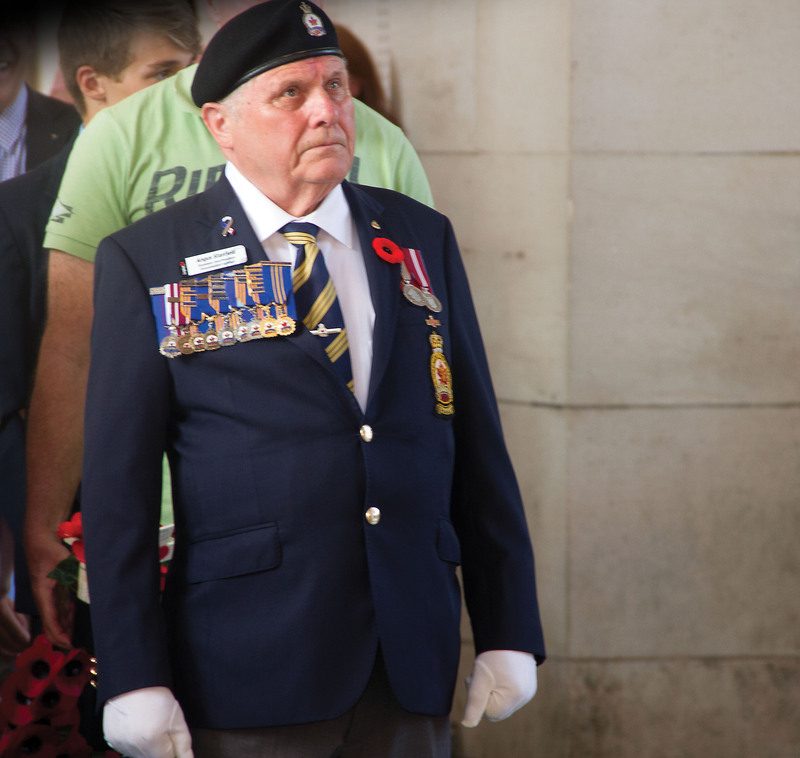 Pilgrimage leader Angus Stanfield prepares to recite the Act of Remembrance at the Menin Gate in Ypres, Belgium. With 43 people in the delegation, it was the largest group since the pilgrimage’s inauguration in 1989. Originally an annual trip, it has taken place every second year since 1997. The command pilgrims were John Archer of British Columbia/Yukon Command, Bobbi Foulds of Alberta-Northwest Territories Command, Dwane Burke of Saskatchewan Command, Gordon MacKenzie of Manitoba-Northwestern Ontario Command, Ena Newman of Ontario Command, Michael Fitzgerald of Quebec Command, Buster Rogers of New Brunswick Command, Gilles Painchaud of Prince Edward Island Command, Marion Fryday-Cook of Nova Scotia/Nunavut Command and Sarah Lawrence of Newfoundland and Labrador Command. With them were partners, family and members of the public who had their own reasons for joining. Notable among them was Whitey Bernard of Tofino, B.C. 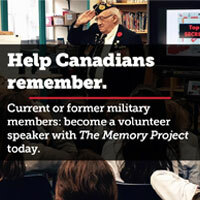 The 82-year-old has found fame in recent years as the boy in New Westminster, B.C., seen running away from his mother toward his father who is parading with troops coming down a hill in the iconic photo called “Wait for me, Daddy.” The photo was used in a Veterans Affairs Canada poster for Veterans Week and has been used on a postage stamp, a coin and was the model for a statue recently unveiled in New Westminster. Paul Kavanagh, a dental surgeon from Laval, Que., was another participant. He helped develop the Canadian War Museum’s program that ships crates full of artifacts to classrooms so students can feel and learn history from their contents. 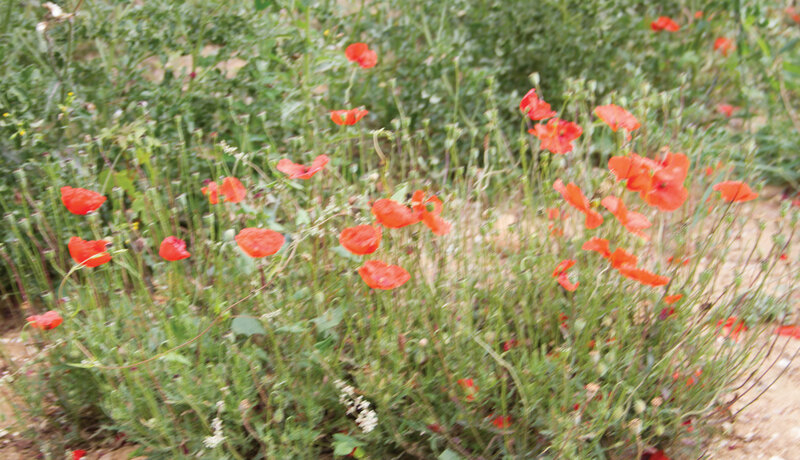 Poppies remind visitors of John McCrae’s poem. I had decided to look for three boys whom I came to know in 2013 when Legion Magazine was given a box of photocopied letters written to and by three Bowes brothers from Boissevain, Man., who served and died in the First World War. I had edited 103 of the letters into a blog, which was posted twice a week for a year. Clifford Bowes was the oldest of the three and had joined up first. He was by far the most prolific author in the collection, writing regularly to his mother and younger sister Vivian. It was Vivian’s daughter, Marilyn Griffith, who retained the letters. Clifford’s two younger brothers Jim and Fred signed up together, served in the same battalion, and in a cruel act of fate, suffered fatal wounds from the same grenade as they prepared for the battle of Vimy Ridge. Buster Rogers of New Brunswick pauses while visiting a cemetery. After settling into a hotel in Caen in northern France, the group travelled to the beaches of Normandy, where on June 6, 1944, 14,500 Canadian soldiers came ashore on an eight-kilometre stretch code-named Juno Beach. 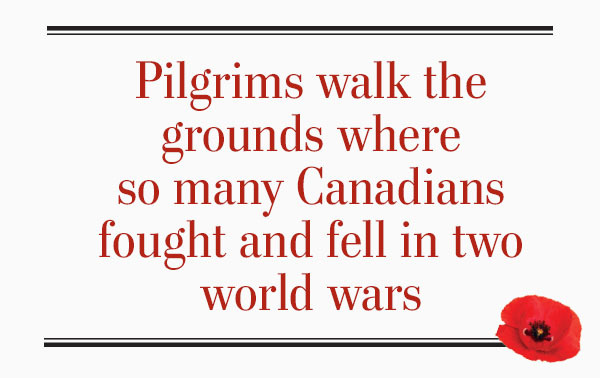 Pilgrims visited each of the three sectors where the Canadians came ashore. At Bernières-sur-Mer, we saw Canada House, the white house near where the Queen’s Own Rifles of Canada landed, which can be seen in the background of many historic photos of the assault. Later, we visited Pegasus Bridge, named for the emblem of the British Airborne, which landed in gliders in the wee hours of the morning and successfully captured and held key bridges to help the advance. While the original bridge has been replaced, it still stands nearby at the Pegasus Bridge Museum devoted to the story of those early landings. 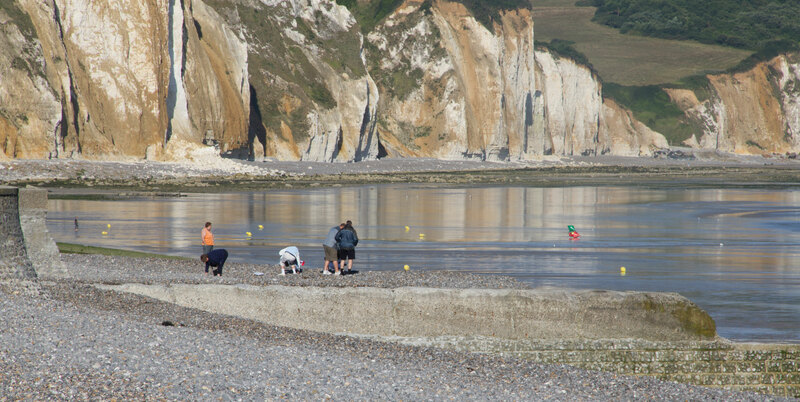 Pilgrims walk along the pebbled beach at Puys, one of the three beaches where Canadians landed during the Dieppe raid in 1942. It was in the garden that the first formal ceremony of the trip was held. The second formal ceremony was held later that afternoon at the Bény-sur-Mer Canadian War Cemetery, where some of the murdered soldiers are among the 2,048 headstones marking the graves of those who fell on Juno Beach and shortly after. The tour moved on from Normandy to Dieppe where, in 1942, Canadians were involved in a disastrous raid. Huge chalk cliffs, then heavily fortified by the Germans, loom over the pebble beach. 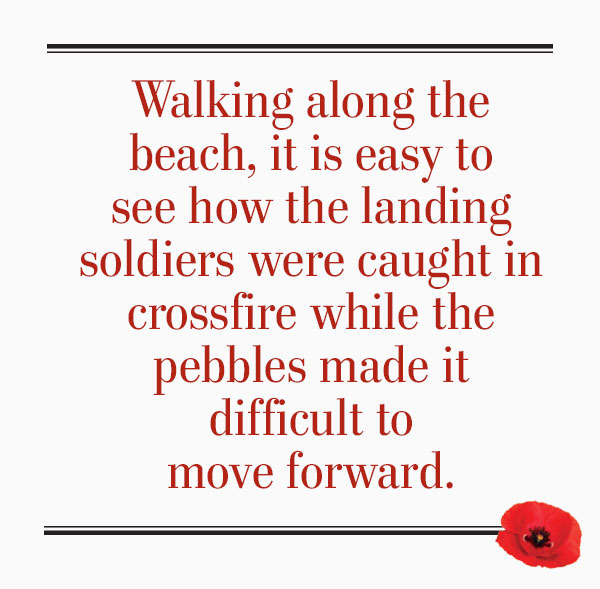 Walking along the beach, it is easy to see how the landing soldiers were caught in crossfire while the pebbles made it difficult to move forward. The Canadians suffered 3,367 casualties, including 907 killed. The pilgrims walked to the end of Dieppe’s long pier to perform an informal service to remember those lost at sea. After the Act of Remembrance was recited, a wreath was dropped into the ocean. The day ended with a formal ceremony at the Dieppe Canadian War Cemetery. While the cemetery has the distinctive headstones of the Commonwealth War Graves Commission (CWGC), it is different in that many of the graves are placed head to head instead of in separate rows as they are in most CWGC cemeteries. This is because the soldiers were buried by the Germans. While the CWGC replaced the original markers with their own, the graves were not disturbed. Before settling in Belgium, the group took a morning trip into the Netherlands to the Bergen-op-Zoom Canadian War Cemetery. There are 1,118 graves, including 63 Royal Canadian Air Force aircrew. 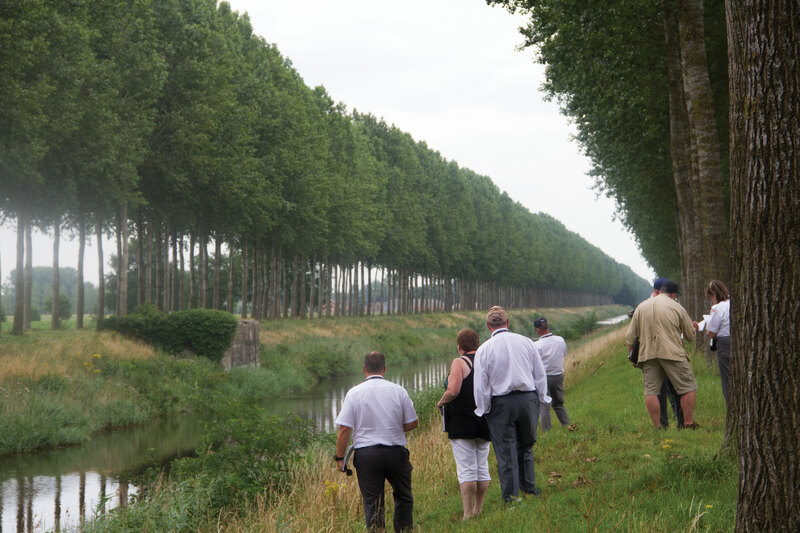 Pilgrims view a machine-gun bunker on the Leopold Canal in northern Belgium. The rest of the trip focused on the First World War. Throughout the war, the Allies held the Ypres Salient, a deadly inroads into the enemy lines where they were surrounded on three sides. Ypres was in ruins but it never fell. The skeleton of the bombed-out tower of the Cloth Hall remained standing and could be seen by the Allies for miles around. Following the war, the residents rebuilt their city, including many of the gothic structures dating back to the Middle Ages. Foremost in the market square is the Cloth Hall, which now houses the In Flanders Fields Museum. The Menin Gate was built as a monument to the Commonwealth soldiers. Every night at 8 p.m., traffic through the busy arch stops and volunteer firefighters arrive with bugles to play the Last Post. Throughout the year, various regiments and school groups participate in the ceremony. The pilgrims would have that honour on their final night in Ypres. All those participants with Legion uniforms marched into the gate and lined up at the opposite end from the buglers. Stanfield read the Act of Remembrance and a wreath was placed while a visiting school choir from Georgetown, Ont., sang. Among the places visited was Essex Farm, where there was a dressing station during the Second Battle of Ypres in April and May 1915. Major John McCrae, a Canadian doctor originally attached to the Royal Canadian Artillery, worked here tirelessly, seeing to the wounded. At the time, the dugout was supported by timber but it was later reinforced with concrete. It remains today and gives visitors a sense of the cramped conditions. Essex Farm was where McCrae wrote his famous poem, “In Flanders Fields,” supposedly in 15 minutes, after presiding over a funeral service for his friend and fellow officer, Lieutenant Alexis Helmer. Thinking of that poem, we stopped by the massive Brooding Soldier at the Saint Julian Memorial at Vancouver Corner, featuring the image of a soldier wearing a helmet in a rest position leaning on his reversed rifle. The statue marks the Canadian position when they first encountered a gas attack. Not having gas masks, the troops did what they could to protect themselves, including wrapping urine-soaked handkerchiefs around their mouths. Nonetheless, they held their position, although casualties were high. We also visited Passchendaele, also known as the Third Battle of Ypres, where a smaller memorial marks the sacrifices of the Canadian Corps. Although the battle itself began on July 31, the Canadians only became involved in October and were tasked with taking the village. The Canadian Corps commander, General Sir Arthur Currie, did not want the assignment. He estimated that it would cost 16,000 casualties. When ordered to proceed, Currie insisted on time to build proper platforms for the artillery and for the officers and men to rehearse taking their objectives on a mock battlefield behind the front line. In the end, the attack was a success, but Currie’s prediction was eerily accurate, with the Canadians suffering 15,654 casualties, approximately 2,600 of them fatal. Many of those casualties are buried in Tyne Cot Cemetery, the largest British military cemetery in the world. There are 11,956 Commonwealth dead buried there, including 1,011 Canadians. A curved wall is inscribed with the names of nearly 35,000 men who have no known grave. It was here that Ontario pilgrim Newman talked of Sgt. Robert Barr of Oxford Mills, Ont. While moving from Ypres to Arras, France, the group spent time at the Beaumont-Hamel Newfoundland Memorial. It features a bronze statue of a caribou, the emblem of the Royal Newfoundland Regiment, staring steadfastly at the enemy position. Although all is green now and covered with trees native to Newfoundland, the grounds were left intact, with deep trenches and craters caused by artillery fire. Berkley Lawrence, Sarah’s husband and now the president of Newfoundland and Labrador Command, told the group of his grandfather, Stephen Lawrence, who was wounded in the shoulder and survived the battle, which virtually wiped out the regiment on July 1, 1916, the first day of the Battle of the Somme. Although his grandfather recovered, he was wounded again in the same shoulder later in the war at Gueudecourt and invalided back to Newfoundland. 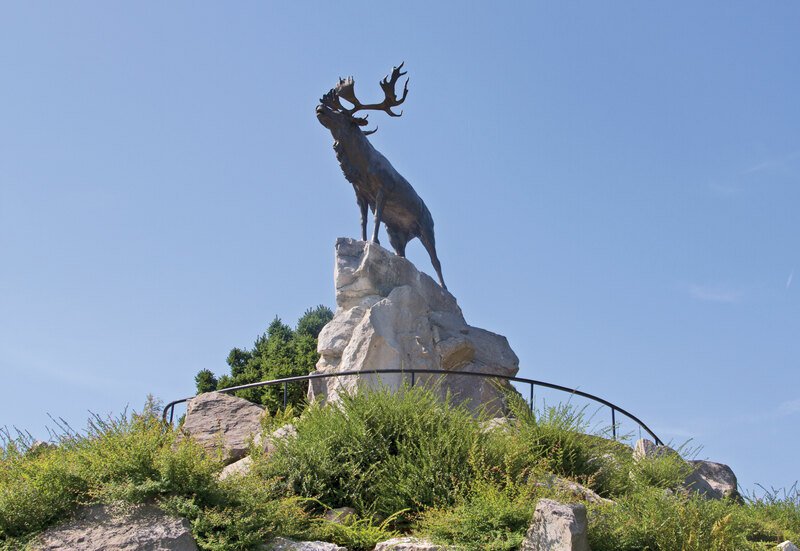 The caribou statue on the Beaumont-Hamel Newfoundland Memorial stares directly at the enemy lines. At the Sun Quarry Cemetery near Arras, Painchaud spoke of Jerome Arsenault from Summerside, P.E.I. “I imagine he would have felt very much at home here. As we drive around and see the rolling hills and fields growing wheat and potatoes, it looks very much like where he and I come from on the western part of the Island,” he said. A highlight of the tour was the stop at Vimy Ridge. It was there, 100 years ago, that the Canadian Corps was brought together for the first time and assigned to take the vast ridge with its commanding view of the front lines. Under the command of Sir Julian Byng, the battle was meticulously planned. 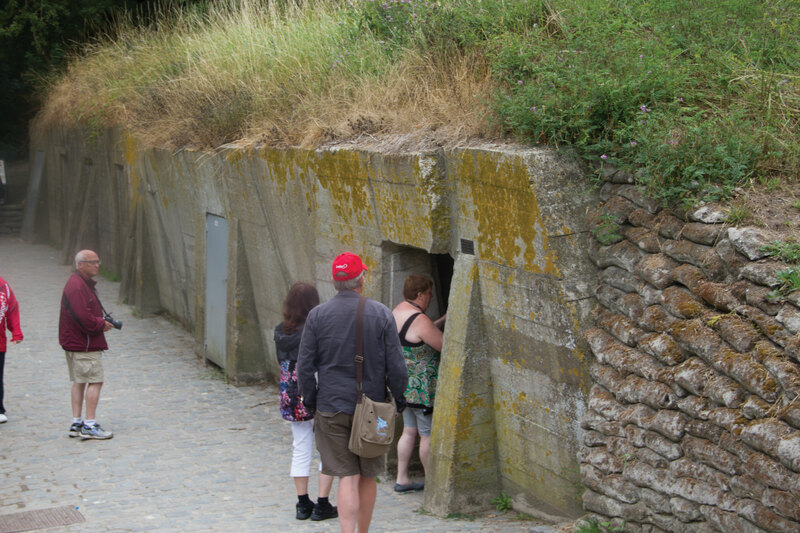 Tunnels were dug in the soft chalk to plant mines under the enemy and to build passageways from which the Canadians could emerge when the battle started. 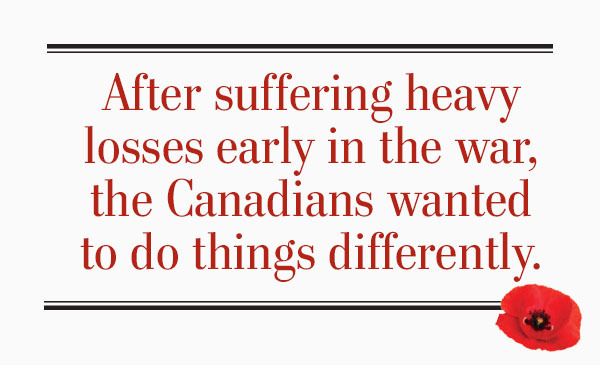 After suffering heavy losses early in the war, the Canadians wanted to do things differently. The attack was rehearsed so that every man knew what his particular role was. Maps were given to the men, so they knew where they were, even in the fog of war. Then on Easter Monday, April 9, 1917, the battle commenced after a brutal shelling of the enemy. A new tactic called a creeping barrage was used. As the men issued out of the tunnels, the artillery fired just in front of them, offering protection as they advanced. Most of the objectives were taken that morning but the fighting continued for four days until the last high point, known as the Pimple, was taken and the Canadians were fully in charge of the ridge. The Canadian National Vimy Memorial in France. 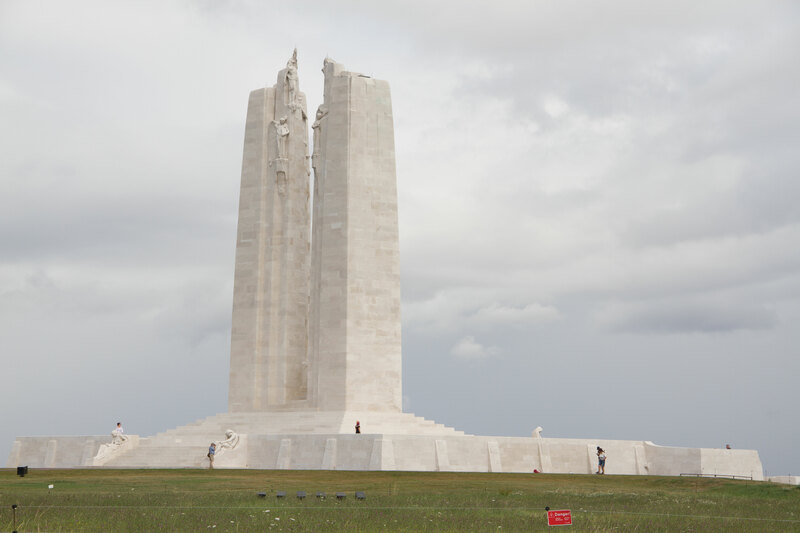 The final formal ceremony of the trip was held at the base of the mammoth Vimy Memorial, unveiled in 1936 and featuring two huge pylons representing Canada and France and the looming figure of a mother brooding over the graves of the valiant dead. The ceremony was conducted under menacing skies. Just as the pilgrims began to approach the wreath to place their poppies, rain came pouring down. That did not stop the pilgrims from completing the ceremony. Ironically, the rain stopped just as the colour party marched off the colours. While at Vimy, I thought of the two younger Bowes brothers, Jim and Fred. They were part of a work crew preparing for battle in February when they were hit by a grenade. Jim died of his wounds that day and is buried in Villers Station Cemetery. Fred, who never fully gained consciousness, died the following week in a hospital and is buried in Barlin Communal Cemetery. The two Bowes brothers are in such cemeteries. I like to think, in this 100th anniversary of the battle they did not live to see, some Canadians stopped by to pay their respects.